Is It Really Wise For The President To Be Giving Out His Personal Cellphone Number? Most of us tend to be quite selective about who we give our phone number to so you would instantly assume that the President of the United States would guard his personal cell number with a great deal of secrecy too. Well, apparently that isn’t the case. In yet another break from convention, President Donald Trump has been handing out his personal cellphone number to world leaders, telling them to call him directly, raising security concerns in the White House. Even if it is just for conversations with other world leaders, it’s still more than a little hypocritical of President Trump to be using a personal phone when he has spent a great deal of time and energy berating Hillary Clinton for using a private email server while she was Secretary of State, claiming the practice left her vulnerable when sending confidential information and leading to chants of “Lock her up!” from Trump supporters while on the presidential campaign. 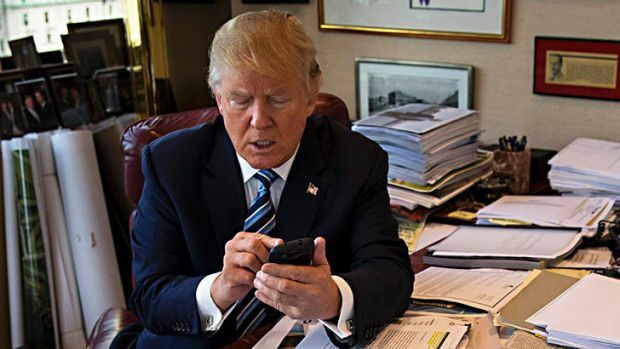 According to both former and current unnamed US officials, President Trump has urged the leaders of Mexico and Canada to call him on his personal number, however, only Canadian Prime Minister Justin Trudeau has taken him up on the offer. Furthermore, according to an unnamed French official, Trump also swapped phone numbers with Emmanuel Macron, President of France, when the two spoke immediately after Macron’s victory earlier in May. Although it doesn’t seem that crazy to think that world leaders might hit each other up on their cells, leader-to-leader calls generally follow a standard protocol. In the case of US Presidents, calls are usually placed on one of several secure phone lines, including those in the White House Situation Room, the Oval Office or the presidential limousine. According to national security experts, Trump using his cellphone for such calls puts him at an extremely high risk of being listened in on, particularly by foreign governments. A perfect example of this practice was when Edward Snowden leaked that the US was monitoring German Chancellor Angela Merkel’s cell in back in 2013, despite Germany being an American ally. “If you are Macron or the leader of any country and you get the cellphone number of the president of the United States, it’s reasonable to assume that they’d hand it right over to their intel service,” said Ashley Deeks, a law professor at the University of Virginia and former assistant legal adviser for political-military affairs in the U.S. State Department. Giving your personal number out when you’re a New York City real estate mogul is obviously common practice, but Trump should probably find another way to make his deals now that he is President of the United States.